In very general terms, “silhouette” refers to a cut, drawn, or painted shape in black on a piece of white paper or other material. Originally, these black-and-white likenesses were known by various other labels, including “shades,” “shadows,” “shadow portraits,” “shadow pictures,” “black profiles,” “black shades,” “profile shades,” “shadowgraphs,” “scissortypes,” and “skiagrams” (the last a term still used in medical photography). “Silhouette” is actually an eponymous term, named after Étienne de Silhouette. Born in Limoges, he had studied economics and attained minor fame for his French translations of several works by Alexander Pope and other English writers when he gained favor with Madame de Pompadour, mistress of King Louis XV. Silhouette was appointed France‘s Controller-General of Finances in 1759, but his budget-slashing measures were so austere that he was removed from office after only eight months. By that time he was considered such a cheapskate that the mocking term “à la Silhouette” had been coined to describe anything miserly or inexpensive. He retired to a chateau in Bry-sur-Marne, where it was said he spent time on his hobby of cutting paper profiles that he reputedly used as cheap interior decorations. Although English painter Henry Fuselli used the term “silhouettes” in London as early as 1810, it is likely that the popularization of this art form’s most familiar and enduring label was due to the influence of Augustin-Amant-Constan-Fidèle Edouart (1789-1861), one of the foremost profile artists of his time and maker of the first and third images shown here. Edouart began calling his shadow portraits “silhouettes” in 1829, referring to himself a “silhouettist,” and others soon followed. Some speculate that Edouart thought the French term was a more elegant way to distinguish his work from more expensive painted profiles, others that he believed the then-commonly used terms “black shades” and “black shade man” were somehow dismissive of his art. Born in the French harbor town of Dunkerque, Edouart was a decorated soldier in Napoleon’s army but lost most of his property at the time of the evacuation of Holland. He moved to England in 1814 where, like many other émigrés, he first tried to earn a living teaching French, but found too much competition. Edouart then began making the intricate hair portraits known as “mourning art” and successfully established himself in London. In 1825 he began cutting silhouettes and by the following year was working exclusively in this form. Edouart traveled in England, Ireland, and Scotland; he arrived in Edinburgh in 1829 and spent three years there. He also wrote A Treatise on Silhouette Likenesses, published in 1835. Edouart was best known for his simple, lifelike, and remarkably expressive full-figure profiles, often featuring distinctive personal accessories such as hats, canes, and eyeglasses. These figures were sometimes done as group portraits, or several were later arranged together in a larger composition. Edouart cut freehand with scissors from black paper; it is said he could perfectly execute a silhouette in less than two minutes. Despite his prolific output, Edouart relied on no assistants and disdained the use of mechanical tracing devices. He refused to use color, bronzing, or gilding in the embellishment of his figures, although in his later work he sometimes indicated hair, clothing, and other physical details in pencil or chalk. Edouart cut two original silhouettes of every sitter and kept the duplicate in his folios, meticulously recording the name and date on the back of each profile and at the bottom of every page; often he went back to add handwritten notations about the marriage or death of a subject, or the silhouette of a family member that he had cut later. From 1839 to 1849 Edouart visited America. Many of the most prominent political figures, distinguished citizens, and noted celebrities of the 1840s sat for him, including six presidents and ex-presidents. (Edouart also cut many silhouettes among the Society of Friends, or Quakers, in both Great Britain and America.) Misfortune struck during Edouart’s return voyage to England when his ship wrecked off the island of Guernsey. Although all aboard were saved, only about fourteen of his folios were rescued. Edouart eventually returned to France, where he died in Quines near Calais at the age of 72. The deft cutting skills of silhouettist William Henry Brown (1808-1883), maker of the second and last images shown here, have been favorably compared to those of Edouart. Born in Charleston, South Carolina, Brown moved to Philadelphia as a teenager. He made his artistic debut when he was only sixteen with a full-length silhouette of Lafayette, made during Lafayette’s triumphal visit to Philadelphia in September 1824, nearly fifteen years before Edouart arrived in America. Brown initially trained in the profession of engineering, however, which he continued to practice in Philadelphia until at least 1841. But by the early 1830s Brown was increasingly devoting himself to a career as a silhouettist. He began this work first in New England, then returned to the South, where his subtly embellished full-length figures became very popular. Brown spent a great deal of time in Charleston in the 1840s and early 1850, as well as traveling widely throughout the region. He visited Mississippi several times, including Vicksburg in 1842 or 1844, Natchez in 1844, and Jackson in early 1846; he also went to St. Louis and New Orleans. Like Edouart, Brown cut his silhouettes freehand. As Brown later wrote of himself in his 1874 book, The History of the First Locomotives in America, “from his earliest recollection, he has been gifted with a rare and peculiar talent or faculty (entirely intuitive in him) of executing with wonderful facility and accuracy the outlines or form of any person or object from a single glance of the eye, and without any machinery whatever, but with a pair of common scissors and a piece of black paper.” Brown’s fame spread when E.B. & E.C. 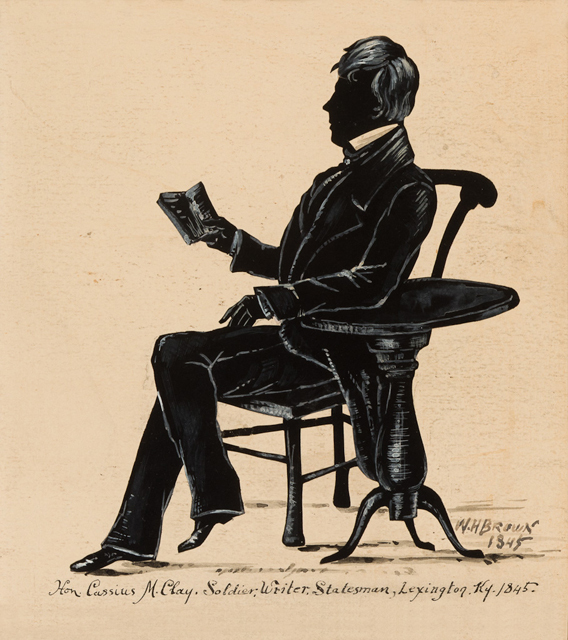 Kellogg of Hartford, Connecticut, in 1845 published a collection of his full-length silhouettes on lithographed backgrounds in Portrait Gallery of Distinguished American Citizens, with biographical sketches, and fac-similes of original letters. (Each letter facsimile was in the subject’s own handwriting.) Almost the entire edition was destroyed by fire, but fortunately the Kelloggs had also published individual lithographs of silhouettes from the book. Brown was one of the last silhouettists to work on a very large scale. As he wrote in 1874, “This peculiar style of outline portraiture … was not confined to shaping the mere outlines of persons or faces, but was extended to portraying entire family groups, military companies, fire companies with their engines and horse-carriages, sporting scenes, race-courses, and marine views, representing a harbor and shipping. All were executed in black paper, and with a pair of scissors …” In 1831, Brown cut the inaugural run of the first American-built locomotive in New York, the “De Witt Clinton,” along with the train’s tender, first two coaches, passengers, engineer, and conductor; he later presented this six foot long silhouette himself to the Connecticut Historical Society, where it is still on view. Brown’s silhouette of the St. Louis Fire Brigade included an engine, two hose carriages, and sixty-five firemen; the finished work was twenty-five feet long. Brown also developed “pasties,” collages of watercolor and pen overlaid with cut-out paper figures. One of his most celebrated compositions using this technique was Hauling the Whole Week’s Picking, an 1842 panorama that consisted of four panels and measured about nine feet, now in the Historic New Orleans Collection. Brown continued to pursue his profession as a silhouettist until the late 1850s, when demand for silhouettes had dramatically fallen with the increasing prevalence of photography. He resumed his career as an engineer in Philadelphia, then in 1859 went to work for Pennsylvania’s Huntingdon & Broad Top Railroad. Brown eventually returned to Charleston, where he died in 1883. Silhouettes were created using four basic methods: painted on paper, card, vellum, ivory, silk, or porcelain; painted in reverse on glass; “hollow-cut,” usually with the assistance of mechanical tracing devices; and cut freehand with scissors or, less frequently, sharp knives or embroidery needles. American examples of painted silhouettes, usually done in black ink on paper, are scarce; American silhouettists also did not reverse-paint on glass. Silhouettists had to blacken their own paper until the 1820s, when black paper became commercially available. Freehand, or “cut-and-paste,” silhouettes are cut from black (or dark-colored) paper and then pasted onto a piece of white (or contrasting light-colored) paper. These profiles can be either bust-length or full-length. Sometimes several full-figure silhouettes were assembled in a familiar setting, such as a family group engaged with their hobbies in a drawing room or outdoors with their pets; the background sheet of the composition might be a drawing or watercolor detailed by hand, or a stock lithograph. Cut freehand silhouettes, such as those shown here, were made by artists having the talent to cut an accurate portrayal without using any tracing aids. In both hollow-cut and freehand silhouettes, the image appears dark on light. But with the hollow-cut process the profile is cut out from the center of a sheet of white (or light-colored) paper, leaving a “hollow” paper outline that is then backed with another sheet of paper or fabric that is black (or other contrasting dark color). Hollow-cut silhouettes are usually bust length. One production method involved positioning the subject so that a strong light cast the sitter’s profile onto the paper, where its outline could be traced. However, hollow-cut silhouettes were seldom done entirely by hand. Instead, mechanical tracing devices were used for speed and accuracy. These commonly had a bar connected to a stylus or pencil, so that while the bar was physically moved along the sitter’s profile, its outline was traced onto a small sheet of paper by the stylus or pencil. This mechanism was often connected to a pantograph, which could copy, enlarge, or reduce the life-size image onto another sheet of paper; the sheet could also be folded to produce multiple portraits. Unlike the images shown here, most silhouettes made in the United States were hollow-cut, largely because of the dominance of machine-cut silhouettes. Ancient Greek and Roman painters are believed to have been the first artists to invent mechanical devices for capturing the outline of a person’s shadow cast by sunlight, lamplight, or candlelight. The 1772 publication of Essays on Physiognomy, for the Promotion of the Knowledge and the Love of Mankind by Johann Caspar Lavater, a Swiss minister, revived interest in the practice of physiognomy, a pseudo-science which claimed that personality traits are linked to physical features. He believed human character could be revealed through interpretation of the silhouette and developed an apparatus that allowed an artist to trace a sitter’s shadow, cast by a lit candle onto a screen. Lavater’s device resembled an early version of the physiognotrace, designed in France by Gilles-Louis Chretien around 1783-1784. But it is Englishman John Isaac Hawkins who is credited with inventing (and patenting) the physiognotrace, a five-foot tall mechanical device with a tripod resembling an easel, in 1802. Hawkins gave a friend in Philadelphia, artist and entrepreneur Charles Willson Peale, the right to use the physiognotrace in his museum from 1803 on. It was an immediate and long lasting attraction; over 8,500 silhouettes were cut during its first year of operation. Historically, shadows have been associated with mystery, darkness, evil, and death since ancient times. 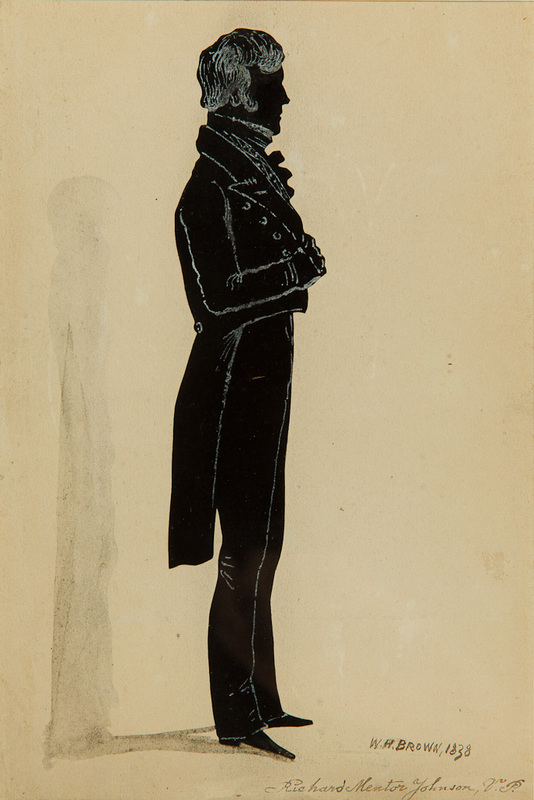 But early artists eventually discovered that drawing the human shadow against a lighter contrasting background could not only capture its physical shape, but also express identity and personality through stance and other specific characteristics, even when the figure or face was viewed from the side. Profiles and “shades,” as black shadows portrayed against a white background were known in antiquity, appeared in early Egyptian, Persian, Minoan, Greek, Etruscan, and Roman art and decorative accessories. When in 1738 archaeologists began unearthing Herculaneum and Pompeii, cities buried by twelve feet of volcanic ash from the eruption of Mount Vesuvius in 79 A.D., their discoveries sparked a renewed interest in classical art throughout Europe. And ancient coins, pottery, and mosaics with profile images helped bring the once-popular art form of “shadow portraits” back in style. Before the development of modern cameras and photography in the nineteenth century, personal portraits were a luxury. Commissioning a full color likeness, whether a large oil painting on canvas or a small delicate watercolor on ivory, was an expense that only the wealthy could afford and typically took hours or days to complete. Miniature portraits were quite fashionable among the aristocracy, who had worn portraits as jewelry since at least the fifteenth century. There seems to be some debate whether silhouettes first emerged as a decorative art form in England after Elizabeth Pyburg (or Rhijberg) cut paper profile shades of England’s King William III and Queen Mary in 1699, or they originated in France during the late 1600s and flourished in the German court at Weimar before reaching England. In any case, the fascination with silhouettes grew into a European craze by the early 1800s. From about 1750 until 1850, silhouettes became a particularly popular form of portraiture with the middle and lower classes, since the simple black profiles offered the ordinary person an affordable alternative to more traditional portable painted portraits. These inexpensive paper likenesses could be obtained in a matter of minutes, typically for only a few cents to a quarter even when done by a professional, compared to the cost of a few dollars for a painted profile and twenty dollars (or more) for a detailed miniature portrait in watercolor or oils. Many silhouettists were amateurs and it was even considered a suitable pastime for ladies. (Women were among the most skilled professionals, too, as were some youths, considered child prodigies). Some silhouettists developed a recognizable style, such as in their treatment of hair and clothing details, or how they cut the curve at the bottom of a bust-length profile. Silhouettes were often given as mementos and could be kept loose, framed, or compiled in albums and scrapbooks. Early eighteenth century silhouettes were all black, but by the end of the century silhouettists had begun to add detailing by hand and even a hint of bronzing. As consumer demand for more elaborate decoration rose, conspicuous embellishments such as jewelry, lace collars, and elaborate hairstyles appeared. By the early nineteenth century, silhouettes were becoming associated with elegance, an appeal that reached across all income levels. Wealthy patrons commissioned silhouettes as tiny as one-quarter inch to be mounted with precious stones in jewelry and other accessories much more expensive than the image itself. 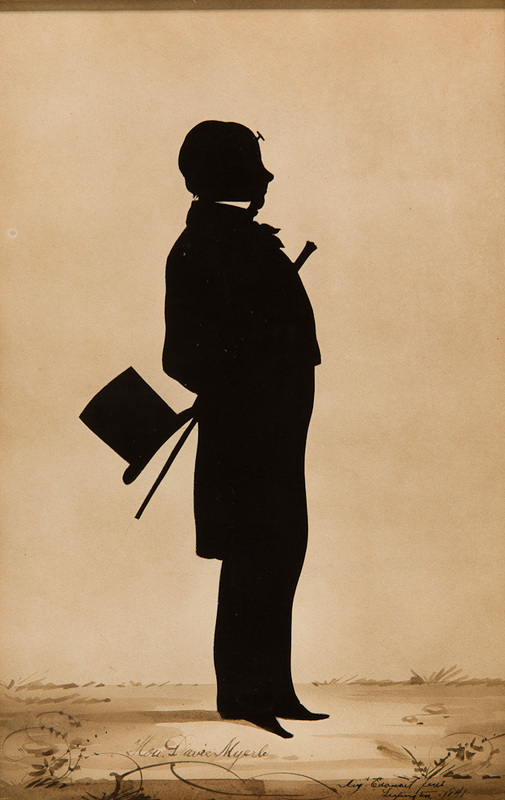 An astounding number of silhouettes had been produced for customers in every economic class by 1850; some silhouettists claimed to have produced thirty thousand or more during their active years. After the Revolutionary War, silhouettes made their way to America, where they quickly became popular. Portraiture had become an important element in establishing the new country’s national identity, as had the currently fashionable Neoclassical style in architecture and the decorative arts, which shared the same classical roots as the silhouette. Amateur silhouettes appear in America as early as the 1780s. Much of the silhouette’s success in America was due to mechanical tracing devices, however, and studios using them were first set up by a few French immigrants In the 1790s. There also were many talented anonymous artists, known today by designations like “the Puffy Sleeve Artist” and the “the Red Book Artist,” who produced hollow-cut silhouettes with hand painted or stock lithograph bodies in a distinctively American style during the early 1800s. Silhouettes reached the height of their popularity in America from about 1810 to 1850. Many of the professional silhouettists in America were English or French by birth, seeking their fortunes in a new land. The making of silhouettes was quite a potential commercial opportunity: adept freehand silhouettists could cut a likeness in minutes without investing in any special equipment beyond a pair of scissors, while simple mechanical devices gave less skilled practitioners the ability to make a silhouette (and numerous duplicates) accurately, quickly, and inexpensively. Even renowned artists like Gilbert Stuart and John James Audubon occasionally turned to cutting silhouettes for ready cash. 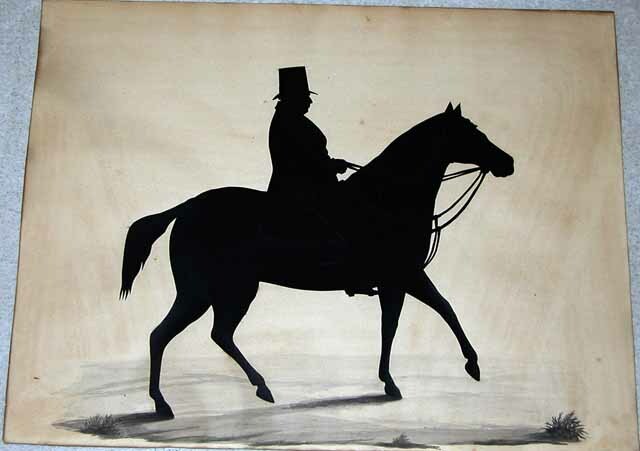 Silhouettes were particularly popular in New England, but as national demand grew for these inexpensive portraits, professional silhouettists became readily available in most major American cities, while many itinerant silhouettists regularly traveled through the smaller towns and less populated countryside. (Mechanical tracing devices were cumbersome and difficult to transport so typically were found in urban areas.) Often silhouettists were relentless self-promoters, advertising the latest techniques and innovations in local newspapers or broadsides to entice curious customers, and relying on showmanship to make the art of cutting an entertainment. Silhouettes soon appeared in the homes of anyone who could afford them. But within a few years of Louis-Jacques-Mandé Daguerre’s 1839 announcement of his new photographic process in Paris and its introduction to America in 1840 by Samuel F.B. Morse, daguerreotypes already were becoming common and at prices competitive with painted portrait miniatures. The cost of these mechanically captured images plummeted after William Henry Fox Talbot obtained a patent in 1841 for the calotype process, which evolved into modern chemical photography. Although silhouettes and photographs initially co-existed in Europe and America, the development of paper photography in the late nineteenth century provided an even quicker, cheaper, and more accurate form of portraiture that could be easily duplicated and circulated. Eventually photographs replaced silhouettes, although these remain charming reminders, as well as important pictorial historic records, of a bygone era. .
On William Henry Brown, see “A Relative’s Reminiscences of William Henry Brown,” Antiques vol. 44, no. 6 (December 1943), pp. 300-1; Alice Van Leer Carrick, A History of American Silhouettes: A Collector’s Guide, 1798-1840 (Rutland, VT: Charles E. Tuttle Co., 1968), pp. 150-62; and Anna Wells Rutledge, “William Henry Brown of Charleston,” Antiques vol. 50, no. 6 (December 1954), pp. 532-33.